Many smokers do gain some weight when they quit. Even without special attempts at diet and exercise, however, the gain is usually less than 10 pounds. Women tend to gain slightly more weight than men. There is evidence that smokers will gain weight after they quit even if they do not eat more. For some, a concern about weight gain can lead to a decision not to quit. But the weight gain that follows quitting smoking is generally very small. It is much more dangerous to continue smoking than it is to gain a small amount of weight. You are more likely to be successful with quitting smoking if you deal with the smoking first, and then later take steps to reduce your weight. While you are quitting, try to focus on ways to help you stay healthy, rather than on your weight. Eat plenty of fruits and vegetables and limit the fat. Be sure to drink plenty of water, and get enough sleep and regular physical activity. Set a goal of 30 minutes of physical activity 5 or more times a week. If you don't already exercise regularly, please check with your doctor before starting an exercise program. Smokers often mention stress as one of the reasons for going back to smoking. Stress is a part of all of our lives, smokers and nonsmokers alike. The difference is that smokers have come to use nicotine to help cope with stress. When quitting, you have to learn new ways of handling stress. Nicotine replacement can help to some extent, but for long-term success other strategies are needed. As mentioned above, physical activity is a good stress-reducer. It can also help with the temporary sense of depression that some smokers experience when they quit. There are also stress-management classes and self-help books. Check your community newspaper, library, or bookstore. Spiritual practices such as prayer and meditation have been used very successfully with other addictions and are an integral part of 12-step recovery programs. These same principals can be applied to quitting smoking and can help with stress reduction. It is hard to stop smoking. But if you are a tobacco user you can quit! 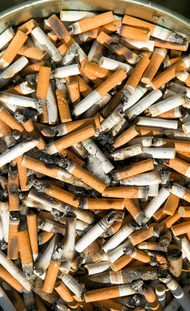 More than 46 million Americans have quit smoking for good. Many organizations offer information, counseling, and other services on how to quit as well as information on where to go for help. Other good resources where help can be found include your doctor, dentist, local hospital, or employer. If you want to quit smoking and need help, contact one of the following organizations.